A 74-year-old female presented to the hospital with nausea and vomiting. Three days ago, the patient felt food sticking in her throat after she ate apple pie, following which she started having nausea and vomiting. She was not able to eat or drink much after that episode but she continued to have episodes of nausea. The patient had similar symptoms when she was diagnosed with esophageal stricture several years ago. The esophageal stricture was thought to be secondary to severe GERD. She had past endoscopic dilatation twice, following which her symptoms improved, but she has not had recent esophageal dilatation. Physical examination was unremarkable. Laboratory test results were normal. Single contrast barium swallow was performed. 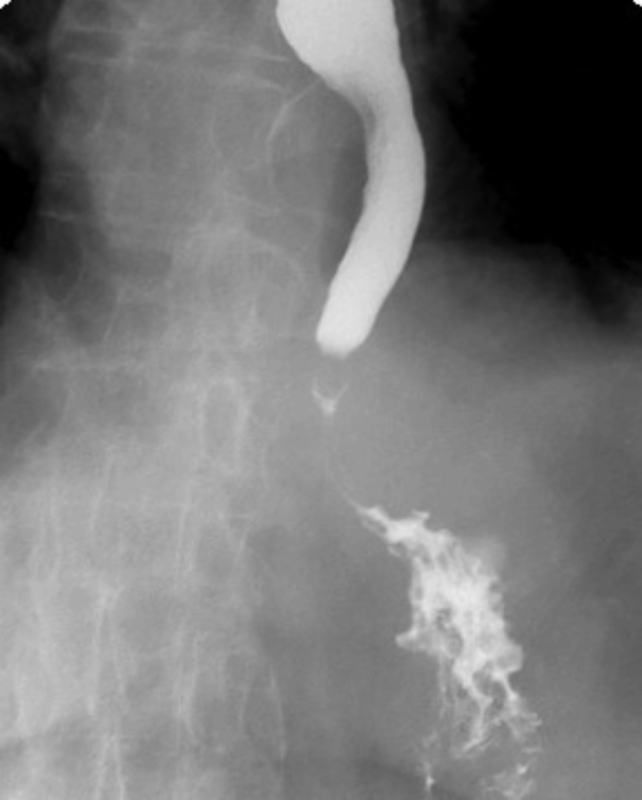 Single contrast barium swallow revealed a tortuous esophagus (Figure 1) causing the contrast to flow slowly down the esophagus (Figure 2). 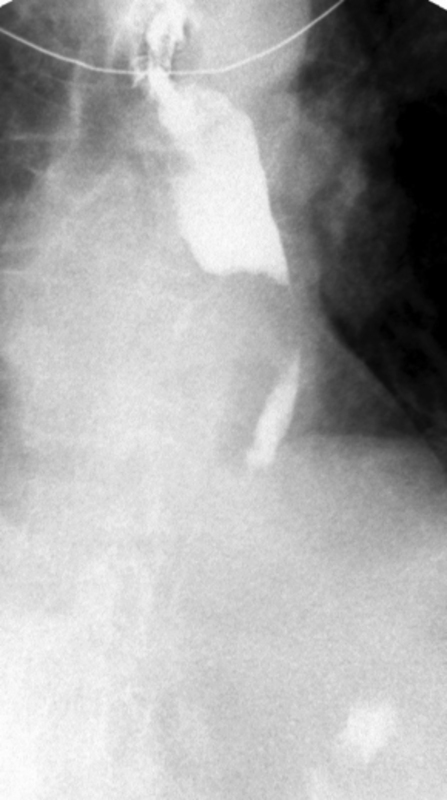 In the mid esophagus, there is a large collection of intraluminal barium with surrounding radiolucent halo (Figure 3). Distal to this collection, the esophagus is narrowed (Figure 4). There is likely narrowing of the gastroesophageal junction. There was passage of a small amount of contrast into the stomach. 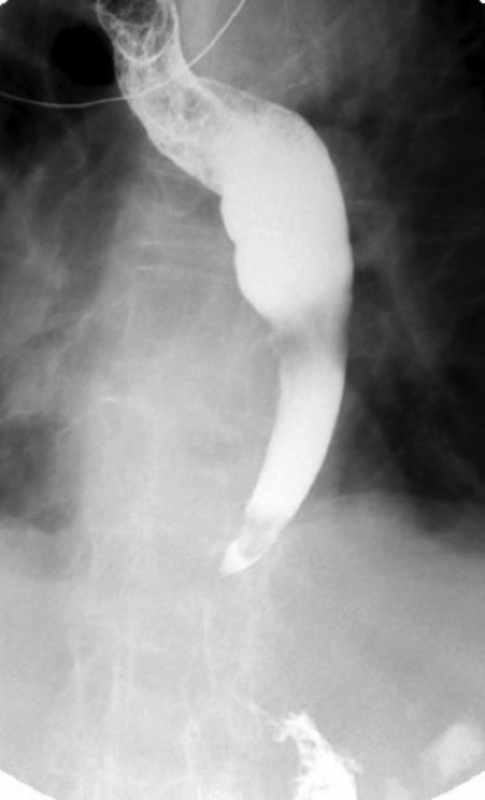 The majority of the barium remained in the esophagus after 10 minutes of examination (Figure 5). In our case, a large collection of intraluminal barium with surrounding radiolucent halo (Figure 3) and distal esophageal narrowing (Figure 4) was demonstrated on barium swallow, indicating the existence of the diverticular structure which communicated with the esophageal lumen. Intraluminal esophageal diverticulum is a rare entity that was first described radiologically by Nelson in 1947. Intraluminal esophageal diverticulae are usually related to mucosal damage secondary to increased intraluminal pressure. There is a pouch of mucosal membrane that is open proximally and closed distally. Although they may be congenital, intraluminal esophageal diverticulae tend to be acquired lesions related to mucosal damage secondary to increased intraluminal pressure in the esophagus that has been narrowed by an inflammatory process. Nelson, W. I. Congenital diaphragm of the duodenum; case report with preoperative x-ray studies. Minnesota Medicine. 1947(30.7):745-752. Eisenberg, Ronald L. Clinical imaging: an atlas of differential diagnosis. Lippincott Williams & Wilkins, 2010. 5th ed. Schreiber, M. H., and M. Davis. Intraluminal diverticulum of the esophagus. American Journal of Roentgenology. 1977;129.4:595-597. Grand, M., and C. L’Herminé. Diverticule intraluminal de l’cesophage. A propos d’un cas. J Radiol. 1980;61:131-133. Funakoshi, Osamu, et al. Intraluminal esophageal diverticulum. Gastroenterologia Japonica. 1990;25.1:117-121. Cho, Shao-Ru, et al. Vanishing intraluminal diverticulum of the esophagus. Gastrointestinal Radiology. 1982;7.1:315-317. Waldmann, H. K., and A. Turnbull. Esophageal webs. The American Journal of Roentgenology, Radium Therapy, and Nuclear Medicine. 1957;78.4:567-573. Mosimann, François, and Michel Bugnion. 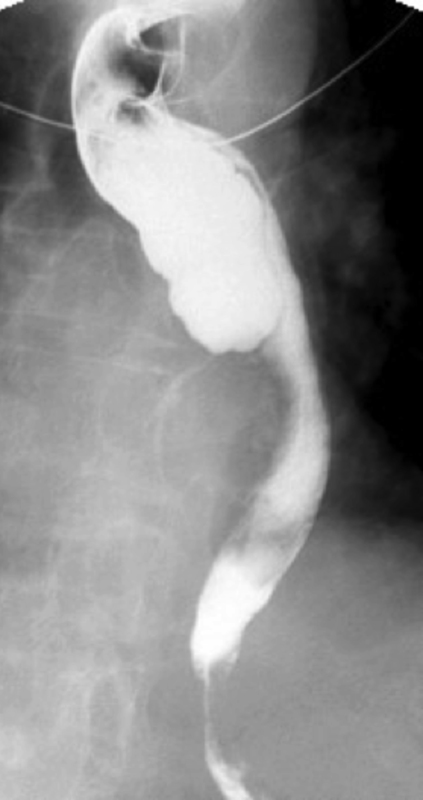 Intraluminal jejunal diverticulum. Gastrointestinal Radiology. 1981;6.1:309-311. Shackelford, Gary D. Barium collections in the stomach mimicking intraluminal diverticula. American Journal of Roentgenology. 19082;139.4:805-806. Tan, K. M. Intraluminal diverticula of the stomach. American Journal of Roentgenology. 1979;132.3:461-462. Beeckman, P. Vanishing diverticula of the stomach. AJR, American Journal of Roentgenology. 1979;133.5:996. Borgstrom, K. E. Ein Bariumkontrastph~ nomen bei der R6ntgenuntersuchung des Magens. Radiologe 3. 1963:384-385. Mohammed AA, Diegnan B, Kanzaria P. Intraluminal esophageal diverticulum. Appl Radiol. 2017;46(8):28-30. Prepared by Dr. Mohammed while a Diagnostic Radiology Resident; Dr. Diegnan while a Diagnostic Radiology Resident; and Dr. Kanzaria while a Radiologist at St. Vincent Hospital, Worcester, MA.